I love telling talking with mustang people and telling the stories of the horses as they relate them to me. The story of Shock Top is very interesting. Horses in the wild form bands. 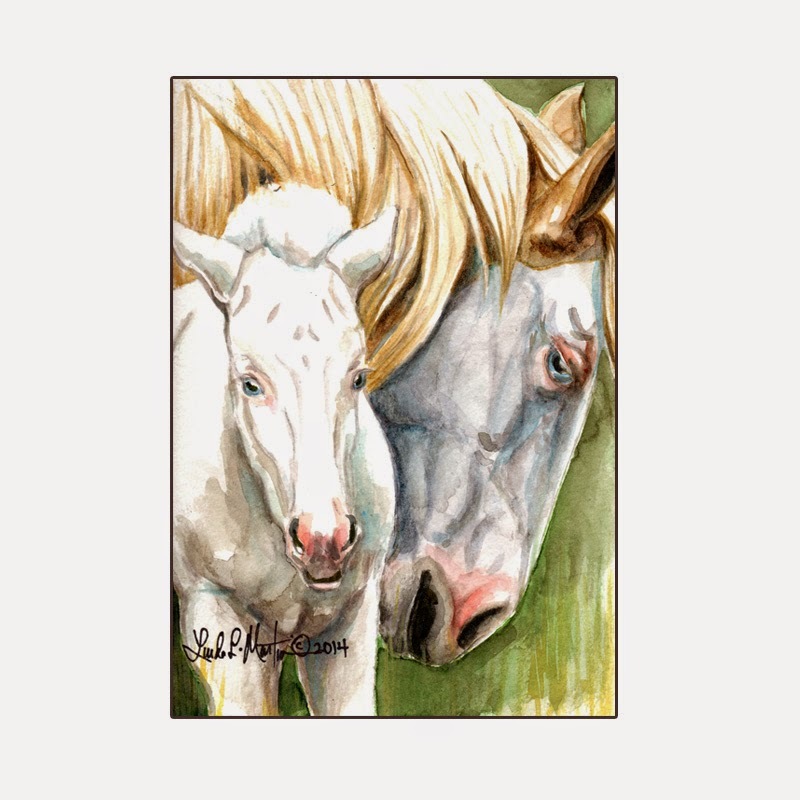 Meaning usually there is a stallion, a mare and their offspring. Bands tend to be very fluid especially when the Range becomes over crowded and there is not enough territory for the horses to stay spread out. In the case of range stallion Davy G he had a mare a foal and one day a domestic horse the photographers named Demi showed up abandoned on the range. No one knew where Demi came from or who abandoned her but it was very apparent that she was a beautiful well bred horse so the local BLM office put an add in the paper saying that she had been found. And that they were seeking someone to claim the mare. The only thing is that she was not branded. Thus there was no record anywhere of her or her owners. Some suspected she simply escaped. Some thought maybe a family relocated from the east where there was not branding law. Others wondered if perhaps she had been stolen and because of her distinct markings they decided it was safer just to let her go on public land. There was no doubt that she was not wild as she willingly approached anyone and knew what apples were. A little known fact: Wild horses have no clue what domestic horse food is and they have to be taught to accept it. It has to be done slowly to not cause colic or ulcers. Davy G quickly adopted Demi into his family with his older mare Yarrow. All the time that Demi was with the small band she never came into foal. Then one day tragedy struck the small band. The mighty stallion Davy G or Davy Greasewood was mortally injured and had to be destroyed. As often happens in the wild there is always a stallion waiting in the wings to take over when a band stallion is old, growing weak, or dies. Sometimes violent fighting occurs and the new stallion drives the mares away. In the case of Davy G. The sorrel stallion Haze waited patiently until the mares were ready to leave and simply walked in and took over. The following year Shock Top was born with his brilliant chestnut red and white splashes of color. A lot of people who do not know wild horses very well and only see them in movies or read about them in books do not understand that rarely do bands stay together for longer than 3 or 4 years. This helps preserve the diversity of the band and keeps them healthy. It has other benefits as well because the older horses will teach the younger horses how to survive in the wild. 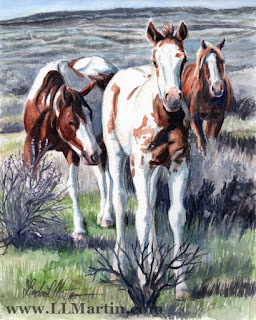 Reference photos for this painting came from John Wagner a frequent photographer of the Sand Wash Basin Herd in Colorado. Thanks to the many advocates and photographers following the Sand Wash Basin HMA in North West Colorado I have been able to follow through personal contact and on Facebook the many wild horses of this herd. "Lighting is a very flashy black pinto horse with what appears to be a large white dagger on his face in the form of a blaze then a lighting mark on his left side neck and stomach. He has other white markings too. Lighting is a perfect example of the ever changing circumstances of the band stallions. Last year, according to heard watchers at Sand Wash Basin HMA, he had a small band of mares and foals, however by this summer one by one each mare had been stolen by other stallions. " 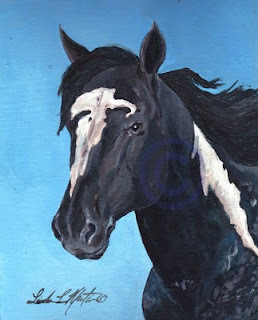 Later in his life in the months before his death, Lightening began to pal around with Picasso, one of the most famous wild pinto stallions in the west and certainly in Colorado. 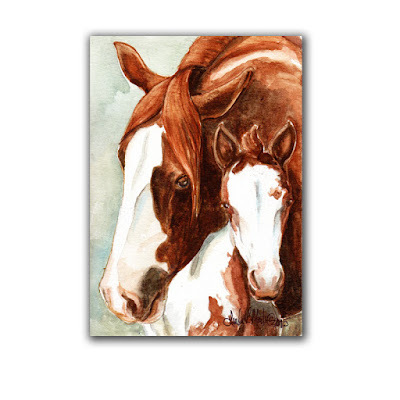 By this time Picasso had lost his mares as well and the two stallions kept each other company. They were seen frequently together on the range. It occurred to me as I heard and read the stories and observations, this is the way really long living wild stallions live in retirement. 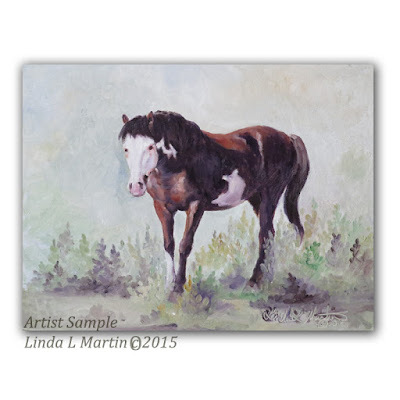 Rarely are wild horses, even stallions, alone and friendless in nature. Special Thanks to Nancy Roberts for the reference photography of Lightning. This gentle mare, Cheyenne and her 2014 foal by Corona, one of the premier and well recognized stallions of Sand Wash Basin HMA, are completely unaware of the controversy surrounding their circumstances. 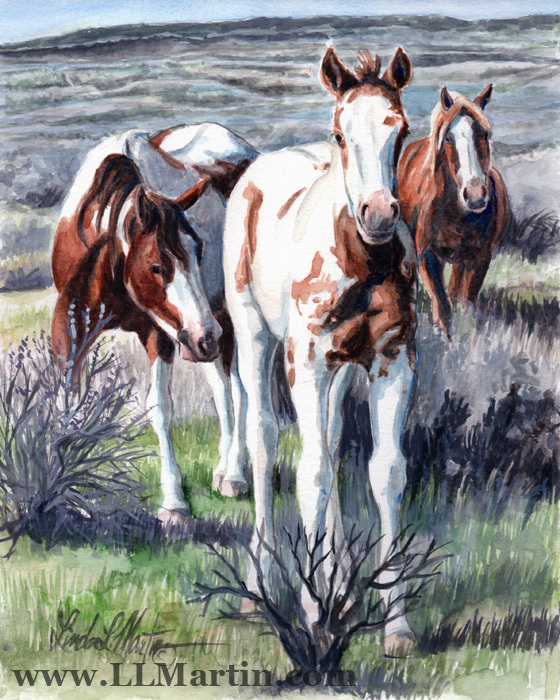 Since the last round up this herd of horses on approximately 160,000 acres of high desert along with seasonal sheep and a healthy number of native wild life have been thriving even in drought. They also have undergone a slower than usual population increase. In 2008 the last round up brought their numbers down to less than 200. These well loved and well visited horses have been documented by an army of photographers who track their bands, locations and changes in health and interactions. Some thought it an inhumane activity to round up the horses then pull some of the oldest most prolific mares and inject them with PZP. PZP has been successfully used in birth control in wild horses since the 1970s in Maryland by the National Park Service. In Maryland and Virginia also it has been used to control deer populations in areas where hunting was not an option for more urban habitats. This administration of the drug was over seen by the Humane Society of the United States. The main operative who darted and observed the horses in the early stages also happened to be someone who was passionately in love with the herd. Her goal from my conversations with her was to find a way that this herd did not have to be rounded up again due to over crowding so the herd could remain healthy and thrive in the wild. 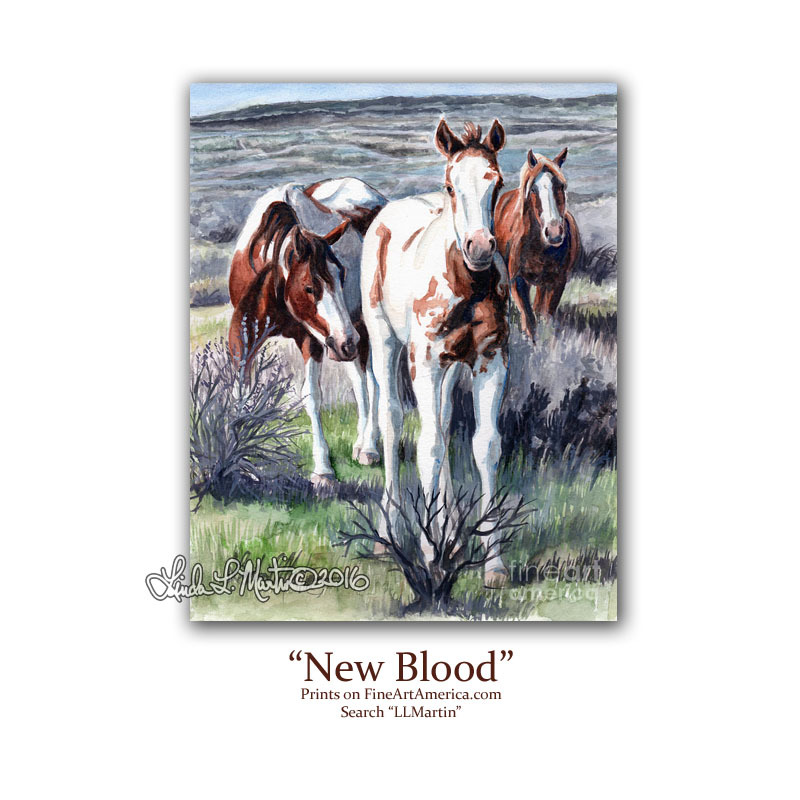 What a lot of people now involved in Wild Horse Advocacy do not know is that it was less than 25 years ago that this herd and all the wild life was devastated by a killing drought and under-management of the wild horses on the Sand Wash Basin. I had the opportunity to correspond with one of the locals who witnessed first hand the devastation. " Once elk thrived there in herds as big as the horses today, and deer too. There were plenty of wild life and forage. Then the populations began to grow in the wild horses. The droughts came and animals began diing. It was horrible. You have never seen anything as awful as all those beautiful animals laying all over the dried ground for miles." She told me that neither the deer or the elk populations have recovered since that terrible time. The problem and also the benefit of Sand Wash Basin is that it is ranch locked. In fact there is a boundary fence completely surrounding the entire range with gates and cattle guards to keep domestics out and wild in. Except when the snow drifts over the fences in winter or the populations increase to the point where young wild horses in search of territories and mares are forced over ( or sometimes through) the fences and on to ranch lands. This did in fact begin happening as the wild horse populations began to reach past their sustainable numbers in late 2012 and 2014. Before 2008 The Sand Wash Basin herd was rounded up every 3 years to keep the populations in check. It was at the 2008 round up that 62 mares were given the PZP. In 2012 it was discovered that the herd population had indeed slowed in growth and doses were given that year as well using darting. The 2012 round up was cancelled. Cheyenne was one of the mares that was a prime candidate of the birth control drug. She was an older mare and a long time lead mare to prominent and prolific band stallion Corona. Her last foal was born in 2009( it is believed she was in foal when administered the drug) and her offspring that year is the well known young stallion Tripod. Tripod is one of the reasons that many of the new advocates who have come to love this herd do not want the herd rounded up again. Tripod was crippled soon after birth. 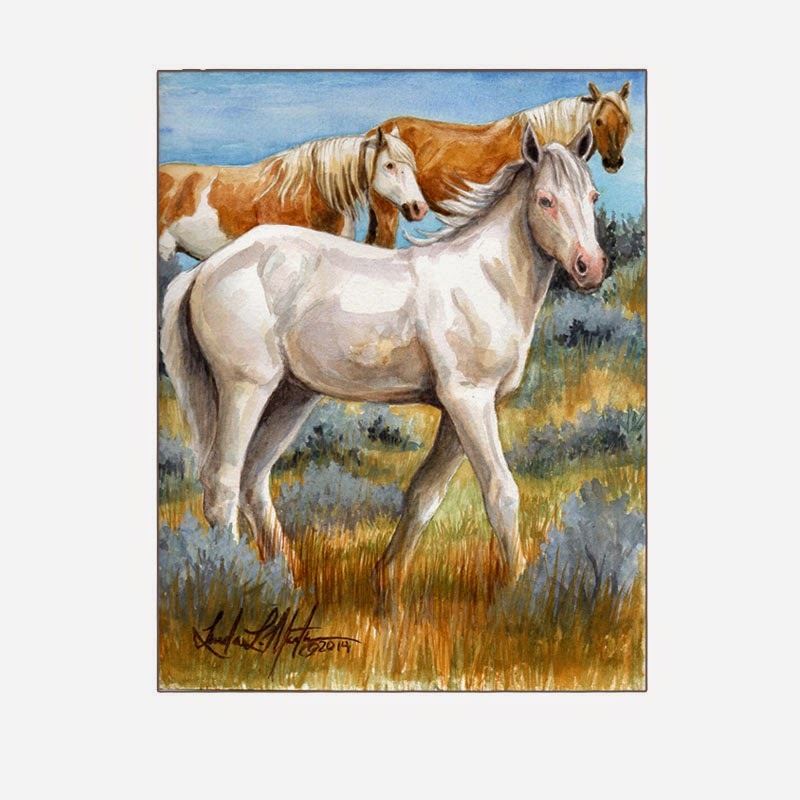 And while he has surprised everyone by thriving and even challenging other stallions, the likely hood that he would survive a round up with his lame leg is very remote. In all likely hood he would be destroyed humanely if a round up were to occure. This year, 2014, was the first year that Cheyenne has produced a foal since 2009. Her beautiful daughter, Laramie, is a creamello with blue eyes and the spitting image of her big brother Tripod. In the words of Nancy Roberts, a long time advocate of this herd and who introduced them to me through her blog and facebook page: "Long may they run!" A special thanks to the Wild Horse Advocates of Sand Wash basin(SWAT), Great Escape Mustang Sanctuary, and all those who have taken the time to share with me about this herd since 2009. Thank you. 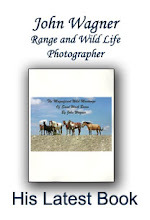 To John Wagner wild horse and wild life photographer, thank you again for the reference shots. All Images and text on this blog are copyrighted by the Artist. All North and South American World and Electronic Rights are reserved. If you would like to use an image or quote please contact the artist via email and state your project. Anyone wishing to share this blog or items contained in it may share it for the purposes of promoting the blog or its contents in limited license but may not use them in part or in whole for any other purpose creative or otherwise with out permission. Photography and Videos are used by the artist with permission please respect the copyrights of those various contributors.